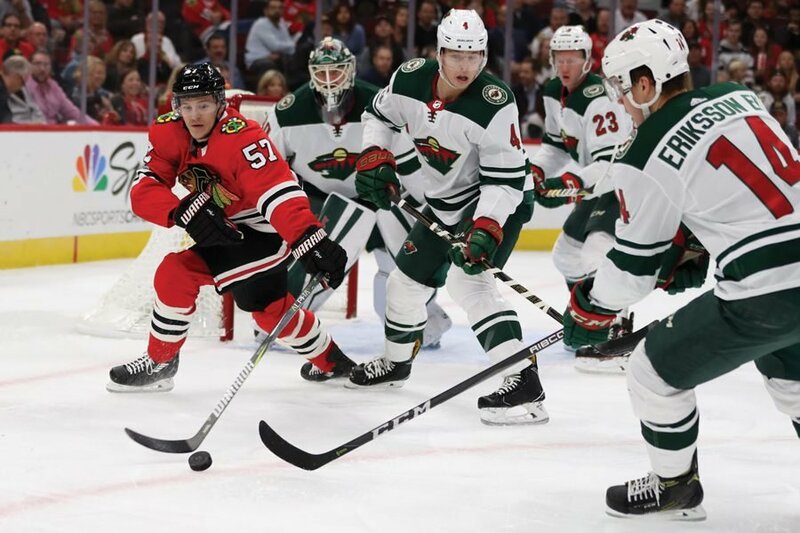 The Chicago Blackhawks' Tommy Wingels (57) battles against a group of Minnesota Wild players in the first period at the United Center in Chicago on Thursday, Oct. 12, 2017. Wingels returned to Chicago to play for the Blackhawks after playing for the San Jose Sharks and the Ottawa Senators. When Tommy Wingels returned home to play for the Chicago Blackhawks, it was a reunion on and off the ice. After playing with the San Jose Sharks from 2010-2017 and one year with the Ottawa Senators, the Evanston-born and Wilmette-raised 29-year-old forward signed a one-year deal in June to play for the team he grew up watching. Growing up, Wingels played for Team Illinois AAA Hockey while attending New Trier High School. On the Blackhawks, he joins other former Team Illinois players, including linemate Ryan Hartman. Wingels said the Blackhawks wanted to sign players who would bring energy to the fourth line. He added that he can bring that intensity with his skating ability and physicality. This season, Wingels is averaging 3.3 hits per game, more than Richard Panik, who led the Blackhawks with an average of 1.79 hits per game last year. Alongside his linemates, Wingels provides the much-needed physical presence the Blackhawks have been searching for. When he was young, Wingels said, he dreamed of playing in the NHL, but it was only toward the end of high school that he realized he had pro potential. Marchi said Wingels’ ability to understand the importance of doing little things right, such as playing smart and leading with a strong work ethic, made him successful. On the road to the NHL, Wingels spent three years playing at Miami University. There, he saw how hockey can impact communities beyond the ice. His college teammate and close friend, Brendan Burke, came out as gay to his teammates in 2009. Several weeks later, Burke died in a car accident. In response to the tragedy, Burke’s brother, Patrick Burke, along with Brian Kitts and Glenn Witman, founded You Can Play — a campaign dedicated to fighting homophobia in sports. Inspired by his friendship with Brendan Burke, Wingels wrote a check to the organization that allowed the group to open a bank account and begin its campaign. Wingels worked with the campaign as a member of the You Can Play advisory board, and will continue to do so from Chicago. He said being in Chicago’s familiar environment has allowed him to focus on hockey while spending time with friends and family, especially his parents. But with Wingels back in Chicago, now playing hockey at the highest level, it’s clear their efforts paid off. Now, not only do they get to see Wingels in action, but they can be there for him as he raises his one-year-old daughter with his wife, Molly Wingels.